When you are a political party hoping to attract a large following, Social Media is perhaps the best way to achieve this. After all, it’s so easy. All you have to do is equip a few willing youngsters with computers, a twitter account and basic knowledge of the English language and you’re all set to take over the Pakistani Social Media world by storm. What if you begin to attract all the wrong kinds of followers? What if those followers are abusive, ignorant and downright stupid? What if you’re valuable supporters begin threatening and abusing anyone and everyone who says anything remotely critical to your party? What if a large majority of these followers have no idea “how” you will bring “change” when asked? What if these loyal supporters lack the capacity for a logical argument? What if people start to hate your party not so much because of who you are but because of how your supporters treat them? What if your ratings with the actual voter bank begin to fall? With 129,976 (and growing) followers on Twitters, 193,624 likes on Facebook, PTI is perhaps the country’s largest political party in Social Media Land. Heck, they even have their own line of branded revolutionary T-Shirts. Of course they still haven’t beaten Pervez Musharraf who towers over them with 435,513 likes on his Facebook page. But that’s another story for another time. PTI is, undoubtedly, one of the best examples of a Pakistani political party dominating Social Media so completely. There has been no other party with such success when it comes to engaging people on SM platforms. However, PTI is also an example of how NOT to do SM in Pakistan. With so much power, comes great responsibility. PTI’s young supporters, its most important and powerful tool, are backfiring. I’ve witnessed threats and abuse from PTI trolls to people on my Twitter timeline; rude and disgusting comments on Facebook pages; personal and sexual attacks on YouTube; all this from PTI supporters who claim their “hero” is faultless and thus consider it almost blasphemous to criticize him. Reasoning and logic have no place in the world of these blind supporters and most people just end up hating the party more than the ignorant supporters. So what exactly happened? How did this whole social thing get out of control? Social Media is not just a few kids with a Twitter and Facebook account. Handled incorrectly and without a plan, Social Media can be your greatest enemy. You cannot jump into Social Media expecting that things will automatically streamline themselves and endow you with Lady Gaga-like powers. From the beginning of PTI’s SM campaign, there is no sign of any strategy or plan. First mistake. Because there is no SM strategy, there is also no code of conduct for its campaigners and supporters. People are free to say what they like and to whom they like. Second mistake. There has been no public reprimand from the party leader despite increasing concerns over PTI supporters’ behaviour. The leader is, in most cases, the person supporters follow through both verbal and non-verbal communication. When a leader uses rude language and takes cheap shots at opposing individuals, is it any surprise that the supporters will follow? Third mistake. There is still time for PTI to mend what has been broken by poor decisions and unplanned campaigns. Otherwise, the party’s most powerful support might just become the reason for its downfall. Disclaimer: This is in no way a political post. It is meant to be a short case study of wrong Social Media use in politics. ← Pakistan and the US – Working for a Greater We or a Greater Me? Tell me how a pti supporter who abuses on the net will be different than that in real life. The screen gives you anonymity but does not change your inner nature. Which is bound to come out sooner or later. Sooner or later this will grow into a militancy wing. Awab and the others have good intentions lets see if they can control it. No other party could do it. "We want Imran Khan to be the Next Prime Minister of Pakistan" has the highest likes of over 442,000. That's is indeed great post without being politically bias. Many people have experience this phenomenon and its getting worse with the increase in popularity. Its commendable the we are having such vigilant political participation from the section of society otherwise quite alienated from this political sphere. But as a nation generally, and in this case particularly we loose out patience quite easily and can't wait to things happen. I guess PTI team should as a matter of policy propagate the need of being calm & composed. Political movements are not carried on social media and also take their own toll if there is some originality in it.I am afraid if this arrogance is not managed, it could backfire to PTI, once they go into real politics of constituencies and parliament. @RababKhan It is a nice post from the neutral point of view but as @teethmaestro is saying that, trolls are trolls. You can never control them. Unless you are hearing this abusive comments from the official pages of PTI or official Twitter account then you should highlight it. PTI is not responsible for any individual who getting carried away in SM. "In victory, what suits your leadership and us workers is a sense of humility before God and his generosity towards us. This has to be shown in our attitudes towards other people also. The Chairman and I have received complaints that some of our friends are being rude on the social media and in other forums. People hate arrogance and misbehavior. People hate being proven wrong too. It is fine to say we told you so.. but when said with an attitude of superiority it pushes people away and then they become jealous of our success. Be polite and courteous always." FOURTH - when you talk about handing the regins to an inexperienced bunch of people - I shared above, this is the youth, this a passionate volunteer of Pakistan tehreek-e-Insaf which passionately believes in the cause - it has the power to stay up ALL NIGHT and ALL DAY moderating forums, moderating facebook, creating videos, creating blog post, responding to twitter messages and managing hundred of emails that are sent to insaf.pk. This is the future of Pakistan, these volunteers have developed into experts, which to us are million times better then any company that you would tell me to hire for a couple of thousand dollars a month if not more. PTI could have spent on the social media and im proud to say NOT A SINGLE PENNY was spent on this platform yet we have a very orgnaized team, who carefully moderates and respects the overall party strategy as if it was its OWN. FIRST Mistake you mention: PTI Twitter and facebook accounts are managed by a large group of volunteers, and not hired professional - inexperienced possibly, but for the past 6 years these stalwarts have held our fort together - when the party was nothing, they may have made mistakes and overtime they have learnt to become very responsible leaders in their own right - to hire "experts" my honest opinion is the moment you PAY someone to do something in Pakistan it falls by the wayside - there is NOTHING more powerful then a passionate volunteer who believes in the cause, ANY DAY ANY TIME I would rather have a volunteer monitoring our PTI pages versus taking chances on a "company" to sell our product ... !!! ??? Ms. Rabab, first of all thank you for this write up, this is really a serious and important issue, PTIsupporters need patience to listen to criticism against IK ans PTI, because I believe healthy criticism is always good to improve yourself. But you also have to understand some points here, first as a nation, we lack patience & a don't know how to do a logical discussion, try to differ with someone on the street, you will get the same kind of behavior, and it also reflects on social media, in fact, they become more aggressive here, coz they know no one can beat em up here. Secondly, common people do what their leaders are doing, I don't need to tell you what our so called leadership has been doing on TV talk shows. So how do you expect sensible argument from a commonperson here. Ms. Rabab, how can you judge me, which party I support If I just come here and start abusing you, I know you will assume me a PTI follower but who knows I'm other party's supporter and just to give bad name to PTI and IK I'm using these dirty tactics. From last two years I'm on a discussion forum and after this PTI jalsa I have witnessed how suddenly other parties' supporters emerged from nowhere and started talking about their parties. 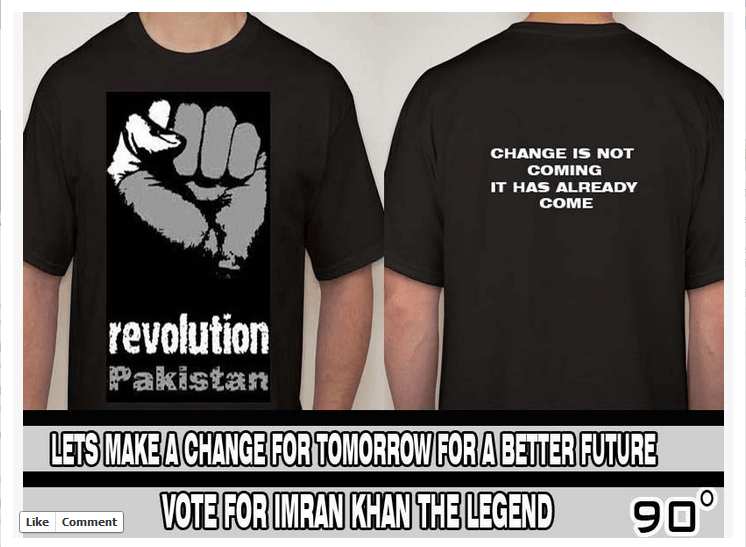 and funny thing is many of them would start like I was a huge supporter of Imran, but now I have realizedthat, etc etc. but their later posts give you exact idea what exactly they are. Now about the PTI followers, see most of them are frustrated and fed up with the old lot of leadership. They see Imran Khan as hope who is honest and trust worthy, and they want to give him a chance, so when they see someone criticizing him with no reason, they resort to misbehave, but personally, I don't approve this behavior and always try to stop if I come across someone misbehaving. AAnd believe me this issue is not only with PTI followers, I have been abused on another party's facebookpage just for criticizing their leadership (it was in no way abusive or trolling) , they did maa behan ke galiyan and the admin of the page was just ignoring it despite my request to ban that guy. I had to delete my comment and after that I just stopped commenting there because i can't withstand this ignorance. @RababKhan you have a much needed post i hope it reaches to the right audience and it can be taken positively. i remember when i met Carlos Cahsman he said that what ever you are doing on social media in terms of social media marketing or campaing it must have a goal on the other end of the pipe line. exactly that is something missing with almost all the political parties who are in SM race in Pakistan especially PTI. very well written. and I must say all the best for the trolls you are going to face after this now :P (just to clarify i am not threatening you because of my political affiliation). very well written @RababKhan , i am not anti PTI too but you see it comes from top, i hate it when even IK calls names of leaders of other parties tu followers tu khud hi abuses tak aa jate hien .. But I am quite stunned that why people are not highlighting the abusive behavior which is using against IK. How can PTI can control young ppl on SM? u cant control the reaction of thousands of ppl. so young generation react to news related to IK.... Infact there are more abuses against IK on FB but no one comment upon tat. Excellent Post Rabab! You have expressed the irritation most of us feel when PTI supporters start harassing me and my friends for criticism of IK. Unfortunately IK supporters hero worship him and are unable to take any criticism. I believe that criticism is healthy and it helps a lot in the longer run. I feel sad that we can't criticize without being attacked by PTI trolls. I recall the day they started abusing me and my friends for no reason. This is one reason why I will never support IK or his party. I don't hate him but I hate his trolls. I am all for a civilized debate on twitter but it is sad that they don't want to hear the person's point of view. That's something unique take. Though I'm not supporting any party but been on social media and bit aware of the way political parties using social media. Agreed with your analytical take on it and hope political parties of Pakistan especially PTI have a look on it and fix the things sooner than later. Seriously good piece.Couldn't agree more.PTI is getting all its moves wrong, trying to engage with one and all for all the wrong reasons and surely in every inappropriate manner feasible.Then again,the PTI "leader's" larger than life image doesn't exactly help the situation;it makes matters worse!Totally agree with you,these cheap tactics will dearly cost the party in the long run.There's gotta be a stop to all this mess.Unfortunately,we can merely hope for the better.Let's just wait and watch. @rababkhan Rabab, very interesting article. Not being from Pakistan I have not been following this Social Media stream. Looking at it from a completely outsider point of view I have to say that one way or another Pakistan Tehreek-e-Insaaf (PTI) is making a mistake. It looks like they are trying to get away with ignoring the Trolls instead of stepping into the conversation. This shows they truly do not understand Social Media or the power of it.